Dayna Morales, a former Marine and a server at Gallop Asian Bistro in Bridgewater, posted a photo on Facebook earlier this month, showing the bill with a line through the space for a tip. The photo of the receipt showed someone had written, "I'm sorry but I cannot tip because I do not agree with your lifestyle." Morales indicated in her Facebook post, and in subsequent media interviews -- including with NBC 4 New York -- that the customer wrote that line. "We've never not left a tip when someone gave good service, and we would never leave a note like that," the wife said. The husband said he and his wife have both worked in restaurants and believe in the value of tipping, and noted that he didn't vote for Gov. Chris Christie because the governor doesn't support gay marriage. "Never would a message like that come from us," he said. Morales told NBC 4 New York on Monday that she was certain she did not receive a tip, and insisted the handwriting on the receipt was not hers. When asked if there had been some sort of misunderstanding, she said, "I don't know, all I know is what I've been saying." 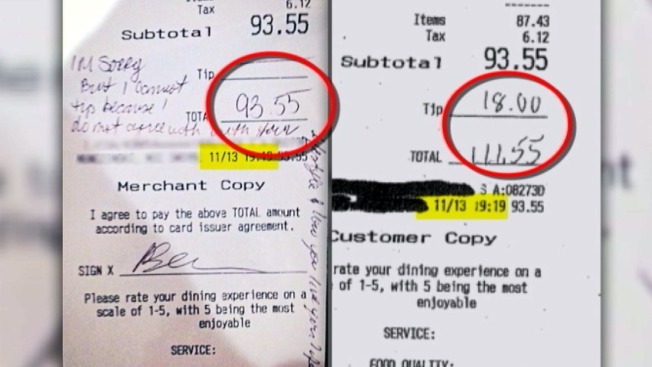 A manager and the restaurant owner insisted they had the original ticket for the $93.55 charge, but would not produce the receipt for NBC 4 New York and could not explain why the family's credit card was charged for more. The restaurant later said in a statement it was aware of the allegations and had no comment pending an internal investigation. Whatever happened, the couple believes it may have begun with a misunderstanding. They said they thought the hostess who sat the family told them their server would be "Dan," and when Morales showed up at their table, the wife exclaimed "whoa, you're not Dan." Morales wrote in her Facebook post that the wife said, "oh I thought you were gonna say your name is Dan. You sure surprised us!" According to the couple, the rest of the meal with their two children went fine. They said they came forward because the story of the receipt note didn't appear to be going away; Morales had recently announced that people were sending her tips from all over the world, and was donating some of the money to the Wounded Warrior Project. "I just felt like people have a right to know that -- it's fine if people want to donate to her or to the Wounded Warriors, but they're doing it under a false pretense," the wife said.